Below you will find an assortment of U.S. climate maps that should prove helpful in planning a wide variety of activities. * The mean date of last freezing temperature (useful for planning spring planting). * The mean date of first freezing temperature at the end of the growing season. 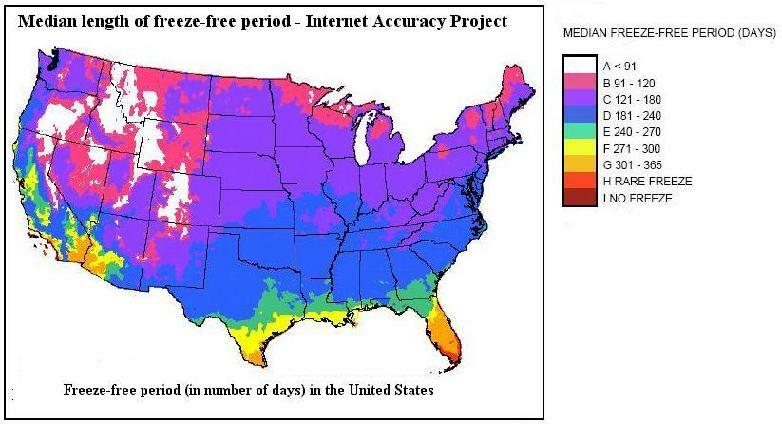 * The median length of freeze-free period. 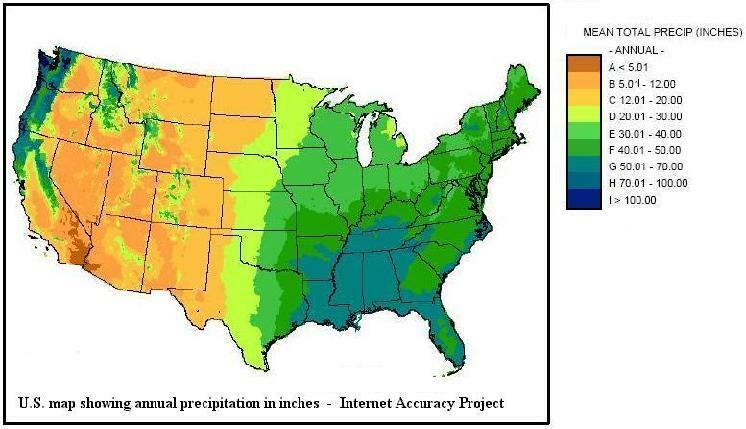 * The total annual precipitation in inches. * The average last date of frost in spring. * The average first date of frost in autumn. * The number of frost-free days you can expect during the growing season. * The average rainfall amount for your area. 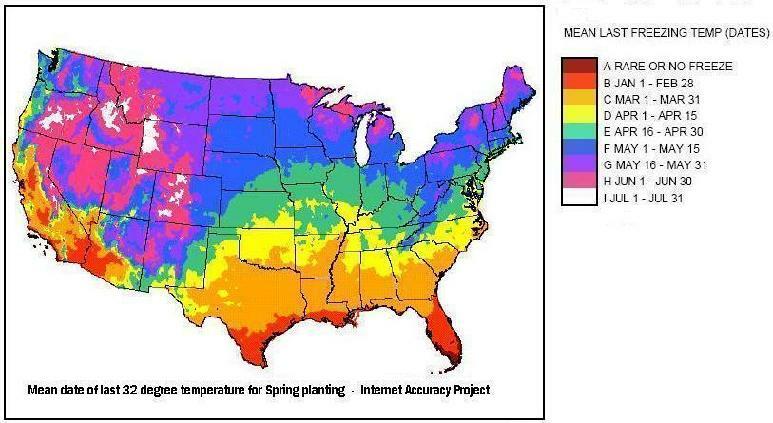 The following maps should be of use whether you're trying to determine the optimum time to plant a garden, the best time to harvest your vegetables, or would like to determine if your area offers adequate rainfall or a sufficient growing season for certain plants, fruits or vegetables you'd like to try. 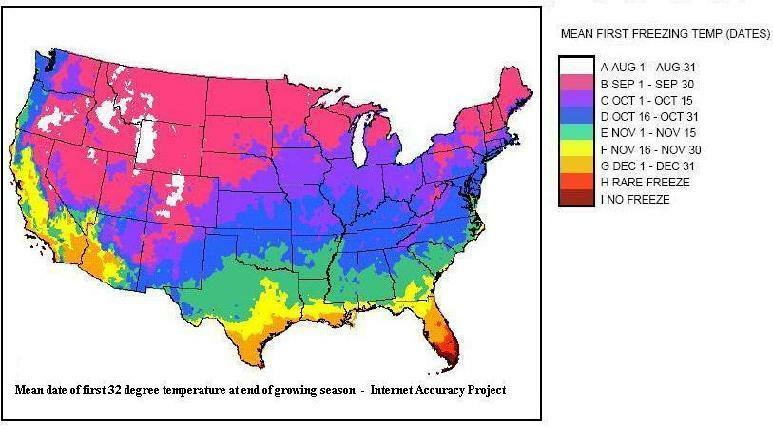 Be sure and visit our page of plant hardiness zone maps to ensure the garden vegetables, fruits and trees you choose are suitable for your local climate. WARNING: Freezing temps can and occasionally do occur after the above dates. Plan accordingly and be prepared to protect your plants or seedlings from frost. WARNING: Freezing temps can and occasionally do occur before the above dates. Plan accordingly by being prepared to either protect your plants, fruits and vegetables from an early frost, or harvest them early, if you prefer. WARNING: There are occasionally years when the freeze-free period is substantially shorter than indicated on the above map. Be sure you are prepared to protect your plants and vegetables from both late-season frost and an early arrival of freezing temperatures. WARNING: There are occasionally years when the amount of precipitation that falls is either substantially lower or higher than indicated on the above map. Take this into consideration if you lack irrigation.